Inducing the flowering of hydrangeas is something that you can easily do by making sure that you're planting them under the proper growing conditions. Induce the flowering of hydrangeas with help from a master gardener with certification in permacultural design in this free video clip. Hello. My name is Jessica Craven. I'm a master gardener and I have my certification in permaculture design. What I want to talk about is how to induce flowers in your hydrangeas. The most important thing is to make certain that your hydrangea is growing in the proper conditions. Hydrangea like shade but they do like some sun, either some morning sun or some afternoon sun. If you're growing your hydrangea in full sun it definitely will not bloom to its full potential. The next thing that you want to do is make certain that your hydrangea gets enough water but not too much water. So this means you want to water your hydrangea about once or twice a week. You want to make certain that the soil is moist but not soggy. If the soil is too dry your hydrangea will not bloom. If it's too moist the roots will get root rot and your hydrangea will start to die and it definitely won't bloom. The next thing you want to do is you want to amend your hydrangea on a regular basis. Because the hydrangea likes to be moist it's a good idea to put mulch around hydrangea. 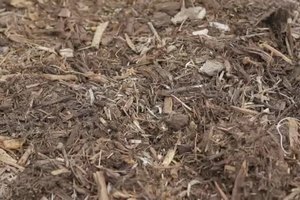 Just make certain that the mulch is a good 2 to 4 inches away from the base of the trunk. This will prevent any fungus or mold growth. 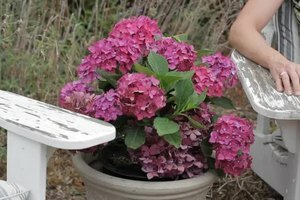 The next thing that you want to do is at least once a month ideally twice a month or if you really want to once a week, water your hydrangea with a compost tea. How you make this is you put one cup of compost into a gallon of water. You can put the compost like into an old sock or a rag, cloth rag and just let it sit in the water for about 2 maybe 3 days and allow a lot of the nutrients to soak into that water and then water this hydrangea with this water. You can then put the used compost back into your compost pile. I hope these tips help you grow very colorful and long lasting bloomed hydrangeas. Jessica Craven has extensive experience working with school gardens, horticultural therapy gardens (for physically and developmentally disabled adults), as well as serving as a garden teacher. What Are Bird's Nest Ferns? 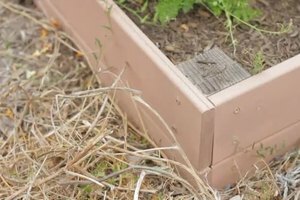 When Is the Best Time to Seed Grass? How Toxic Are Hydrangeas to Pets?